UNITED NATIONS, February 4 -- Water is life, the UN and its water partner Jay-Z have said. Water too can be death. That is the theme of a conference at the UN that began Wednesday night with a reception over the East River. To the sounds of a classical music trio, a woman bragged that she represents Halliburton and Tyco. She asked, Do you know Doctor Oh? Harold HyunSuk Oh is the founder of the conference sponsor, the World Water Organization. Inner City Press asked Dr. Oh, how is WWO funded? Private donations, he said. A supporter of WWO explained to Inner City Press that Dr. Oh was an oil trader who later went to divinity school and then became an academic. Inner City Press asked Dr. Oh directly, and he confirmed the trajectory, adding that he was a fundamentalist pastor even before going into business. Inner City Press asked him what he thinks of Ban Ki-moon's Secretary-Generalship so far. The UN talks a lot, he said, but it does not implement. With Mr. Ban in Pakistan, his Deputy Asha-Rose Migiro was supposed to come to the reception. WWO's Deputy Chairman said that "Miss Mygro," as he called her, was also unable to come due to pressing business at headquarters, but should be delivering remarks the following morning. On the schedule, awards were supposed to be given to financial services representatives of Hope Finance, S.A.. This did not happen. Apparently they did not come either. There was an elaborate sound system, but it was hardly used at all. The M.C. was Elaine Valdov, who a WWO supporter said was "big in the NGO world at the UN," having headed the DPI-NGO some years ago. A more recent DPI-NGO honcho is slated to speak on Thursday. "If you have even one high level UN person supporting you, you can get anything there," a WWO supporter said, requesting anonymity. It brought to mind the booking of the UN's North Lawn for a fundraising benefiting, among others, the Kabbalah Center of Los Angeles, booked by Ann Veneman, the director of UNICEF (which is holding its executive board meeting this week, complete with informal consultation on card and gift sales, a matter of some controversy). Inner City Press asked Dr. Oh who his rabbi, so to speak, is at the UN. "Someone in DESA," he said, "social and economic affairs." But who? 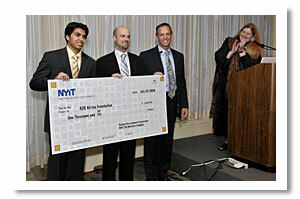 Dr. Oh is affiliated with the New York Institute of Technology. "Not just the one by Columbus Circle," a supporter pointed out. There is a huge campus on Long Island, and other campus in China and India, he stressed. NYIT along with WWO sponsored an earlier water conference at the UN in mid 2008, co-sponsored by UNICEF and the UN Development Program and the World Bank. Another WWO supporter snarked that at an upcoming World Bank water event, the UN "won't even be invited, since they don't do anything." Among the speakers this week are the former NYC environmental commissioner, Joel Miele, and his acting successor Steven Lawitts. There is also representation by the private firm Suez, responsible for controversial water privatization projects from Jakarta to Atlanta, Puerto Rico and Argentina to Manila. A supporter of water privatization, over the wild rice and bow tie pasta served at the reception, tried to convince Inner City Press that opposition to water privatization in Stockton, California -- near Ann Veneman's home town of Modesto -- was misguided, including by the General Assembly President's water advisor Maude Barlow. Even Cochabamba, Bolivia was defended: the locals, the WWO supporter said, just don't understand. Inner City Press' further inquiry into the origins of WWO was led by a connector who says he introduced Dr. Oh to a water expert, in front of a church. 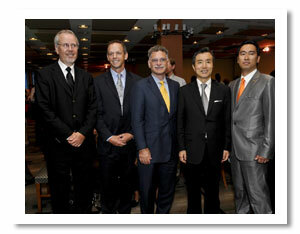 The rest is history, and Dr. Oh confirms that a World Energy Forum is next, already incorporated. Inner City Press is told that moves are afoot to re-open the UN's Millennium Development Goals in order to add a new one: energy. But there are other issue-groups lined up. So what is this conference, of water privatizers, held inside the UN? Perhaps the next two days will tell.